Unlike drugs and injections, which may be necessary right after the incident, chiropractic care doesn’t mask the pain. 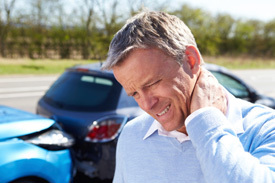 Whether you’ve been involved in a fender bender or a more serious auto accident, your body has experienced trauma that needs to be addressed. Unlike drugs and injections, which may be necessary right after the incident, chiropractic care doesn’t mask the pain. Instead of being a Band-Aid solution, chiropractic is a safe and natural way to restore normal function to the muscles, ligaments and tendons that may be injured in the accident. What if I Don’t Seek Treatment Right Away? Even if you don’t feel any pain or discomfort following a minor auto accident, it’s still critical that you seek care as soon as possible. Delaying care could result in chronic inflammation that leads to permanent problems. These include osteoarthritis, spinal instability, disc herniations, chronic pain and loss of function. Does Your Office Work With Insurance Companies? For your convenience, we work with all insurance companies. Please provide your auto insurance information to our staff and we will take care of the rest. Do You Recommend Any Treatments Other Than Chiropractic Care? At our practice, we also provide soft tissue mobilization techniques such as Trigger Point, Myofascial Release, Active Release Techniques® and instrument-assisted soft tissue mobilization. Help your body heal following an accident with safe and noninvasive chiropractic care. Contact us today to schedule an appointment!